All of our workshops are tailored to fit each group’s needs and interests. Workshops are tactually as well as visually accessible. Certificates of Completion will be awarded at each art exhibit. 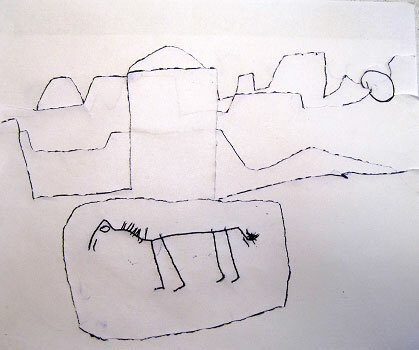 This student, blind since birth, illustrated a typical African village in a raised line drawing. Parents who would like to get information into their child’s hands as events unfold or simply as their curiosity is sparked. Teachers of the Blind or Visually Impaired so they can elaborate on instruction in and out of the classroom. General Educators so they can share key concepts through charts, graphs and diagrams during class. Mainstream Art Teachers so they can add a new tool to their tool box that can help make art accessible for all students. Para-educators so that they can spend less time preparing for the next day’s lessons. Museum Educators so they can share information about things that can’t be touched. And of course people who are blind or visually impaired so that they can illustrate and share their ideas about their world as well! These workshops can range anywhere from a one hour introduction to the BlackBoard to an all day in-depth experience. This workshop is a fun and easy way to understand how perspective works. In this workshop we break down how pictures are organized so that what we draw makes sense to others. Approximate perspective is taught through multi-sensory exercises so everyone can participate, even youngsters. 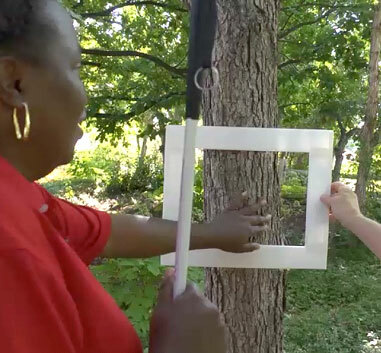 This gives art teachers new techniques to introduce perspective to the inclusive classroom making it accessible to everyone. A student experiencing what is on and off the picture plane. These workshops are run as a three day event. In addition to the three, five hour classes, the first two days we will go on field trips to experience art and gather additional information. The workshop concludes with an art exhibit after the third day’s class. The exhibit give our students an important opportunity to talk about what they have learned in class with friends and strangers. One of the most basic human drives is to express one’s self. One of the hardest things to do is to imbue artistic expression with emotions. In this class we eliminate many of the barriers which prevent people from getting in touch with and expressing their emotions. All participation is tactile, sighted participants will be asked to wear blindfolds. This workshop can be structured from one hour up to 15 hours of class time. In a one hour class students are introduced to the concept of expressing emotions and create two plaster relief sculptures. In the 15 hour workshop we delve in to much more subtle and complex expressions and create 8 plaster reliefs. Each student also completes a finished work of art expressing their own ideas. The two plaster sculptures on the left are an abstract expression of happiness. The two plaster sculptures on the right are an abstract expression of anger. Field trip to an accessible sculpture exhibit for information about how sculpture is made and inspiration about what we can say with our art. Field trip to explore for project reference material. Each student will create a work of art of their choosing. We will celebrate our completed projects with family and friends at an art exhibit. This will give all students a chance to talk about their experience and their work. Certificates of Completion will be presented.